Real time scan rate of 2000 scans per second, the MS-911 is unsurpassed among small fixed mount scanners. The MS-911 is the speediest compact fixed position scanner on the market. It's able to decode 2000 scans/second real time. Perfect for applications requiring a ton of speed, the MS-911's unmatched processing helps out other apps by processing multiple looks at labels, which guarantees a read. This scanner decodes all standard barcode symbologies as well as optical mark recognition (OMR) codes. It easily fits into machinery you already have, and it's small size allows it to be mounted or positioned accordingly. The MS-911 offers a solution to a wide range of industries. 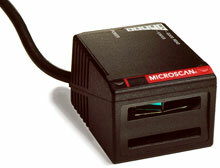 The Microscan FIS-0911-0003G is also known as Microscan Systems	FIS-0911-0003G	or FIS09110003G	.